The WhiteRock Collection is SilverTribe's exclusive line of handcrafted jewelry. Our Sunrise jewelry theme captures all the beauty of a sun rising over the Southwest. For hundreds of years, tribes have watched the sun streak across the expanding sky in brilliant shades of blue, red, pink and orange. Such a stunning daily display has captivated tribes for centuries, inspiring artists to capture such beauty on the face of a ring, bracelet or necklace. Every tone used is meticulously selected and scrutinized to ensure it meets the highest standards of excellence and quality. Specific colors are used in the Sunset jewelry theme, primarily shades of green, blue, orange, red, purple and opal. We always pick the highest grade of stones to match the color scheme. The stones used in this collection are based on quality and availability and may include turquoise, spiny oyster shell, coral, opal or a number of other highly-prized and beautiful stones. Our artists use the inlay technique to craft stunning examples of rings, earrings, bracelets and more. Each stone is carefully selected, carved, ground and placed in genuine sterling silver. The result of such expert artistry is a dazzling piece of Native American inspired jewelry that will compliment any collection, whether you are looking for something subdued and casual, or a truly elegant piece for formal occasions, you're sure to fall in love with our Sunset jewelry theme. Tribes like the Navajo, Zuni and Hopi, who believe the land that has sustained them for thousands of years is sacred, inspire each piece. That's why so much Southwest jewelry reflects the rugged and beautiful desert landscape. If you are in the market for a stunning and unique example of handcrafted jewelry, our WhiteRock Collection carries everything you could ask for. You won't find a higher quality selection anywhere. 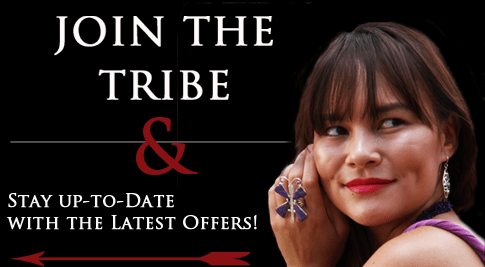 Come see why jewelry collectors with the highest standards choose SilverTribe. We offer the best prices on the largest collection online and always ship orders promptly and for free. Become a Preferred Member by signing up for our email list. We'll send you exclusive deals and product information to ensure you are always in the loop and able to claim the latest and most sought after styles. Shop SilverTribe today, we guarantee you'll be happy with your purchase; which is designed to look beautiful for many years to come.